This guide will show you how to unlock all the badges for your MyPlayer in NBA 2K15. Badges are earned in MyCareer based on how you play, how you respond to situations in scenes, and how good your regular attributes are. Once you earn the bronze version of any skill badges, you can then purchase with VC the silver and gold versions. There's a total of 77 badges available in NBA 2K15, but you cannot have all because some badges conflict (i.e. Alpha Dog and Beta Dog). When trying to get a badge, setting difficulty level to Rookie and putting the sliders on casual and will help make life easier. • Alpha Dog – A team leader who steps his game up in all areas when his teammates are performing porly. ➝ Your player needs to be the highest rated player offensively on your team to get this badge. • Beta Dog – Steps his game up when an Alpha Dog teammate is out or is playing poorly. ➝ Your player needs to be the second highest rated player offensively on your team. • Road Dog – Elevates his play when playing in road games. ➝ Perform well, consistently, over consecutively played away/road games. • Prime Time – Elevates his play in games of great significance. ➝ Earn A+ team-grade consecutively during the playoffs. • Cool and Collected – A player who remains fairly consistent throughout the course of the game. • Closer – A player who steps his game up in all areas in the 4th quarter and overtime of a close game to help his team close the game out. ➝ Make game winning/sealing free-throws, shots, or assists in the 4th quarter of close games. • Fierce Competitor – Elevates his game when being outplayed or instigated. • Spark Plug – Energizes teammates with big plays. ➝ Get hot coming off the bench a few games in a row. • Mind Games – Elevates his game when being outplayed or instigated. ➝ During cut scene with NBA players at center court, never back down from what you say. Always pick the aggressive option which is usually the lower one. (OR with the first cut scene involving your first NBA game with your mentor, pick the lower option). • Enforcer – Wreaks havoc on the floor with physical and tough play. • Mentor – Gets younger players focused in on the game when they commit mistakes. ➝ Start your fourth MyCareer season. • Heart and Soul – Rallies team when things are getting out of hand. Helps team stay focused. • Floor General – Makes his team better offensively just by being on the floor. ➝ Have X amount of assists and your player must have high play-making attributes. • Hardened – Plays through fatigue and injury without experiencing full negative consequences. • Defensive Anchor – Makes his team better defensively just by being on the floor. ➝ Accumulate many "Great Team Defense" ratings in a game over the course of consecutively played game, or play great defense over the course of one regular season, or get into a defensive rhythm (indicated by a pulsing, hollow red circle under your player) by contesting shots, tipping passes, stealing and blocking over consecutively played games. • On Court Coach – MyCareer specific. A player with this badge can get the ball, call plays and tell teammates to shoot whenever he wants. ➝ Must have high playmaking attributes (90+) and high scoring and assists numbers. Most players have got this badge after they maxed their playmaking attributes. Note: The following personality badges have no gameplay affect. These simply help drive the emotional reactions to various in-game situations. 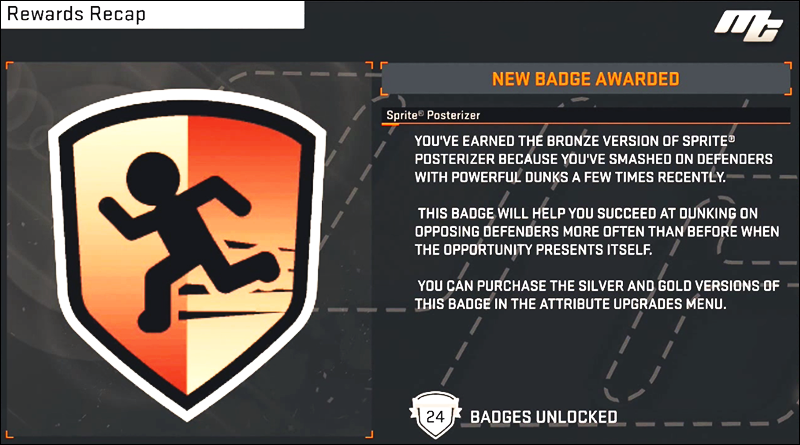 To earn these badges, you need to keep playing MyCareer and respond to questions during cut scenes. It might take a while to unlock all. • Friendly – An outgoing and typically well-liked player. • Reserved – A quiet player that generally keeps to himself. • High Work Ethic – Works harder than the typical NBA player. • Legendary Work Ethic – First one to the gym, last one to leave and the hardest worker at all times. • All-Time Great – Strives to be known as an all-time great. • Low Ego – Values team success more than anything. • Keep it Real – Responds best to tough love. • Pat My Back – Responds best when coddled. • Expressive – Has no problem expressing his feelings. • Unpredictable – Can be erratic in his behavior. • Laid Back – Generally pretty chill at all times. • Volume Shooter – Heats up with every shot, make or miss. However, lack of shots can make him cold. ➝ Attempt 30+ FGAs in one game. It might not work for one game, so try to do it at least 3 games in a row. • Microwave – Only needs a limited amount of made shots to get hot. ➝ Get and stay 'On Fire' in a game over the course of three consecutively played games. • Unfazed – Timeouts as well as quarter breaks do not cool this player down offensively. • Corner Specialist – Known for his ability to knock down threes from the corner. ➝ Hit corner threes over the course of a few games. I got the badge by hitting 5 threes each game in a 5 game span. • Screen Outlet – Excels as the screener in the pick & roll game. • Deadeye – Not bothered as much by defenders when it comes to making contested shots. ➝ Take and Make contested jumpers in consecutively played games. • Limitless Range – Known for knocking down three pointers well beyond the three point line. ➝ Make threes from outside your players Hot/Cold Zones (roughly 30 ft from the basket). • Bank Is Open – Excels at banking in jumpers. ➝ Take and make banks shots in consecutively played games. • Fade Ace – Excels at making fadeaway jumpers. ➝ Make fade-away shots (hold left stick back and shoot while stationary) during a game over consecutively played games. Note that post-up turnarounds and fading shots do not count. • Shot Creator – Known for making tough shots off the dribble after creating space to shoot. ➝ Use your dribble moves to create space and score, or take and make off-balance jump shots in consecutively played games. You may need to have a certain amount of the crossover, hesitation, behind back, etc. badges unlocked before you can get it. • Lob City Finisher – Finishes alley-oops at a high rate. ➝ Make alley-oop dunks over the course of a few games. • Sprite Posterizer – Known for attempting to dunk on opposing players whenever possible. ➝ Make 8-15 contact dunks (Make sure that the teammate grade thing says contact dunk.) You don't have to play back to back games to get posterizer. Just get a certain amount of contact dunks and it will unlock. • Spin Lay-in – Excels at making spin layups. • Hop-stepper – Excels at making hop-step layups. • King of Euros – Shines in his ability to make euro step layups. ➝ Take multiple euro step/side step layups in consecutively played games. • Acrobat – Can change his shot in air and attempt difficult shots with few consequences. ➝ Change your shot out of a lay-up or dunk as many times as possible over consecutive games. • Tear Dropper – Excels at making floaters and runners. ➝ Take multiple running floaters in consecutively played games. • Post Spin Technician – Dominates the post with his ability to beat his defender spin and drive moves. ➝ Perform Spin moves with your back to the basket multiple times per game for consecutive games. • Drop-stepper – Adept at beating his defender in the post with dropsteps. • Post Hoperator – Excels at making hop-shots out of the post. • Post Stepback Pro – Shines in his ability to use the post stepback move to score in the post. ➝ Perform stepback move as often as possible in consecutive games. • Dreamlike Up and Under – Uses an array of up-fakes in the post to fool his defender into jumping. • Killer Crossover – A ball-handler who excels at breaking his defender down with crossovers. ➝ Perform crossover as often as possible in consecutive games. • Spin Kingpin – A ball-handler known for breaking his defender down with spin moves. ➝ Perform spin moves as often as possible in consecutive games. • Stepback Freeze – A ball-handler adept at freezing his defender with stepback moves. ➝ Perform stepback dribble as often as possible in consecutive games. • Behind the Back Pro – A ball-handler who catches his defender off guard with behind the back moves. ➝ Perform behind the back dribble as often as possible in consecutive games. • Hesitation Stunner - A ball-handler adept at freezing his defender with hesitation moves. ➝ Perform hesitation moves as often as possible in consecutive games. • Master of In and Out - A ball-handler known for breaking his defender down with in and out moves. ➝ Perform in and out moves as often as possible in consecutive games. • Pet Move Sizeup – A ball-handler who uses elite size-up moves to break his defender down. ➝ Use your signature size-up move often in consecutive games. • One Man Fastbreak – Excels at taking the ball coast to coast on a fastbreak. ➝ Accumulate multiple "Fast-break Score" Ratings per game over consecutively played games. Pull up 3's count. • Transition Finisher – Adept at running the fastbreak and finishing at a high rate. ➝ Get Steals/Blocks/Rebounds that result in your MyPlayer finishing with a Dunk or Lay-up in transition in consecutively played games. • Flashy Passer – Known for throwing accurate flashy passes. ➝ Perform flashy passes resulting in either a 'good pass' or an assist. • Break Starter – Starts fastbreaks with accurate outlet passes. • Pick & Roll Maestro – Known for orchestrating the pick & roll game as the ball-handler. ➝ Manually call for Pick and Rolls/Fades in consecutively played games. • Lob City Passer – Throws accurate alley-oop passes. ➝ Attempt and make Alley-oop lobs over consecutively played games. • Dimer – An elite passer known for hitting teammates in the correct position to score, giving them a boost on their shot %. ➝ Accumulate X assists in a 1 regular season OR accumulate X assists in your career. • Hustle Points – Known for immediately scoring following an offensive rebound near the basket. ➝ Get X amount of putback dunks/tip-ins. Should unlock at end of season. • Scrapper – A hustle player who wins loose ball battles. • Tenacious Rebounder – Relentless in going for rebounds. ➝ Accumulate between 450 and 1000 rebounds (dependent on your player's rebounding rating) over the course of 1 regular season. • Perimeter Lock-down Defender – A defender that automatically counters the perimeter offensive badges of opponents. ➝ Get into a defensive rhythm in the perimeter (indicated by a pulsing, hollow red circle under your player) by contesting outside shots, tipping passes, stealing and blocking over consecutively played games. • Post Lock-down Defender – A defender that automatically counters the interior scoring badges of opponents. ➝ Get into a defensive rhythm in the paint (indicated by a pulsing, hollow red circle under your player) by contesting layups/dunks, tipping passes, stealing and blocking over consecutively played games. • Charge Card – Adept at placing himself in position to win charge calls. • Pick Dodger – Doesn’t get caught up on screens very easily. ➝ Cheat on screens, go under or over. Do not run into picks over consecutive games. • Interceptor – Adept at stealing passes. ➝ Get 3-5 Steals, by grabbing the ball out of midair on a pass, per game over consecutively played games. • Pick Pocket – Known for his ability to strip the ball from a ball-handler. ➝ Get 3-5 Steals, by stripping a dribbling player, per game over consecutively played games. • Eraser – Amazing shot blocker who counters inside-scoring badges of opponents. ➝ Get at least 3 BPG in the paint over consecutively played games (When I got the badge, most of my blocks were on mid-range/3-point jumpers but I did have some in the paint). • Chase Down Artist – Chases players down on fastbreaks and effectively swats their shots from behind. ➝ Get at least 2 chasedown blocks in a game. • Bruiser – The physical nature of this player drains energy from his match-up. ➝ Play physical by boxing out, causing contact, denying wingers, setting useless screens and fouling hard (hold the X button for Xbox controllers or square for the PlayStation) in consecutively played games. • Brick Wall – Sets extremely effective screens. ➝ Have a strength rating of at least 80 and setting about 150 screens for scores (has to say it in the top right). This tutorial only applies to the Xbox One, PlayStation 4 and PC version of NBA 2K15. We will update this page once we gather more information on how to unlock the remaining badges.